Jerry Rizzi resides in Collin County. He is a private music instructor with Music & Arts. His primary instruments are Cello and Bass Guitar. He also teaches standup bass/bass violin. 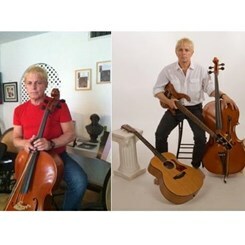 Jerry studied Cello privately at Hofstra University, where he also studied Classical music. He studied Bass Guitar with several noted Jazz musicians. Jimmy Garrison, John Coltrane’s bassists for many years was one of Jerry’s mentors/teachers. Jerry teaches, performs and composes in several different styles/genres. His recordings are a mixture of Classical, Jazz and blues. Included in his compositions are several orchestral works and chamber pieces. Cello lessons are concentrated /focused on classical studies: including scales & technique and especially, music that a student is working on and required to know for school. Method books will include Zuzuki and or Essential Elements. Standup Bass will use similar method books. Bass guitar lessons include technique, theory and songs, with a focus on music which depends on the student’s interest, be it Jazz, Blues, Rock and music for school.